Neue Hofkapelle Graz/Lucia Froihofer, Michael Hell. Johann Joseph Fux was one of the most celebrated musicians of the Austrian baroque. As court composer to the Hapsburgs, his influence was vast, although his reputation did not persist to modern times. In the eighteenth century, Fux was known both for his music and for his work as a theorist. Haydn and Mozart both revered Fux’s 1725 Gradus ad Parnassum, in which he drew upon the principles of Palestrina to show how to write music, especially counterpoint. Fux is also the subject of Ludwig Köchel’s other catalog, which ordered Fux’s works, as Köchel had earlier done with Mozart. Yes, there are K. numbers for Fux’s works. 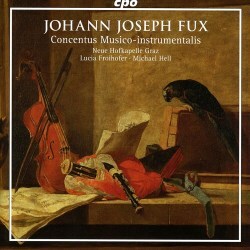 Fux’s earliest work is the Concentus Musico-Instrumentalis, a collection of seven compositions dedicated to the Habsburg Crown Prince, Joseph. Only one copy survived from its 1701 printing, so this is two hours of highly skilled baroque music that barely made it to modern times. This seems to be the only recording of all seven parts of the set. The Neue Hofkapelle Graz is a flexibly sized baroque orchestra, which uses as many as twenty-six players in the grand Serenade, and as few as four in the Sinfonia à 2 for Flute, Oboe and continuo. Fux left the desired numbers of performers open, no doubt to maximize sales of the music. Lucia Froihofer and Michael Hell, who share duties as co-directors of the Neue Hofkapelle Graz, apply good imagination in their choices for ensemble size, recognizing the intimacy of the small-scaled Sinfonia in F, while beefing up their forces for the public music of the C major Serenade, which probably accompanied Prince Joseph and his bride as they ceremoniously entered Vienna. These performances make the most of the music, which is a rather Frenchified series of short movements (fifty-two altogether). There are some lovely Purcellian moments, such as in the Overture in F. The Serenade, which lasts half an hour, deploys trumpets and drums to fine martial effect, and concludes with a movement that may fairly be described as wild. Lully-inspired overtures open several pieces, and the collection contains two ciaconas and a passacaille. Despite these considerable appeals, there are moments which do not hold attention well. As a collection of baroque concerti, Fux’s Concentus Musico-Instrumentalis is not as consistently interesting as Corelli’s Op. 6, Bach’s Brandenburg Concerti, Handel’s Op. 6, or Zelenka’s Capriccii. But that is a high standard, and there is much pleasure to be found in these carefully prepared performances. Michael Hell provides informative and enthusiastic notes for this project.